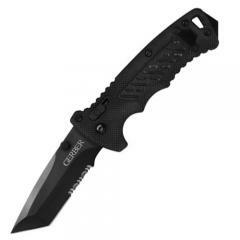 The Gerber Apocalypse DMF Tanto Serrated folding knife offers a rugged, ambidextrous design that is ideal for everyday tactical use. DMF stands for dual multi-function. This folder lives up to its name, featuring a partially serrated Tanto-style blade and a built-in pommel striker in the handle. Similar to short Japanese swords, the original Tanto blade made its mark by offering impressive piercing power through armor. The equally strong, high-carbon stainless steel blade includes a titanium-nitrate PVD coating, offering unmatched strength as well as rust and wear resistance. The texturized G-10 handle is scratch-proof and guarantees a sure grip in all weather conditions, even with gloved hands. The Apocalypse includes a reversible pocket clip and built in lanyard hole for convenient carry options.